David Cameron's (alleged) pig and Fidel Castro's Adidas tracksuit: Your Monday Slatest roundup. Former Cuban president Fidel Castro speaks with Pope Francis on Monday in Havana as Castro’s wife Dalia Soto del Valle looks on. Slate is revamping, revising, retooling, rethinking, and relaunching its many super-outstanding newsletters, and one part of that project is turning our twice-daily Slatest compilation emails into a single newsletter that’s more concise, more personal, and hopefully more effective at conveying and explaining the day’s breaking news. That Slatest newsletter will also be posted on the site, and you can sign up to get it in your inbox here. A book says U.K. prime minister David Cameron may have put a “private part of his anatomy” inside a dead pig’s mouth during a hazing incident when he was at Oxford. The United States is raising the number of refugees it will admit the next few years, though not by that much. Upsetting details have emerged in the case of “Baby Doe,” an infant who went unidentified for months after being found dead in Boston. Authorities believe that the young girl, whose name was Bella Bond, was killed by her mother’s boyfriend. 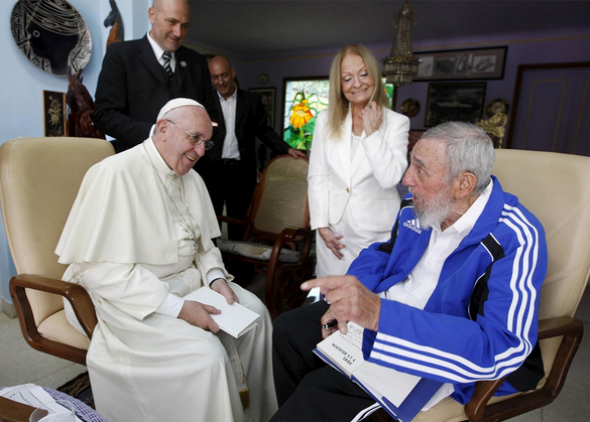 Fidel Castro wore a tracksuit to meet the pope, which is far from the first time he’s conducted diplomacy in a tracksuit, and Slate’s Joshua Keating has some theories as to why he keeps doing that. Carly Fiorina is now more or less running second alongside Ben Carson in national Republican primary polling. Donald Trump is still leading, though not by as much as he used to be. Marco Rubio has come on a little, and Scott Walker has basically ceased to exist. And finally, Fox News did a very Fox News-like thing involving women’s legs and shame. Have a good day out there!